Trevor Bolshaw is a native of Walsall in the West Midlands. He began studying music at the age of 9 with the well-known Midlands broadcasting organist Leslie Taff. He displayed a great interest in and aptitude for the theatre organ which he took up at the Regal Cinema, Darlaston, and was playing interludes in the theatre at the age of 16. This was soon to be followed by his first broadcast. From this he progressed to performances in such famous theatres as the Odeons at Leeds, Birmingham and Manchester and, during the same period, taking up cabaret accompaniment and work in theatre orchestras. 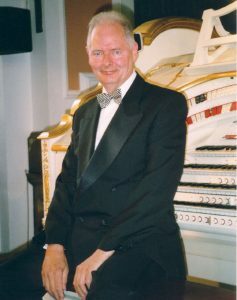 Trevor has lived for over thirty years in Devon where he is involved in teaching, recording and playing concerts, either as a soloist or in an accompaniment capacity. He has visited the U.S.A. many times as a soloist performing concerts in Los Angeles, Phoenix and Atlanta, Georgia where he has appeared twice at the famous Fox Theatre. He has also played concerts at various venues in Holland. His recording and broadcasting credits include the BBC Radio 2 programme ‘The Organist Entertains’ and programmes on BBC Radio Bristol and BBC Radio Devon.